In 1949 five individuals spotted an unidentified flying object hovering over the Rogue River near Gold Beach, Oregon. The Air Force sent a team to investigate and were unable to repudiate the eyewitness claims. 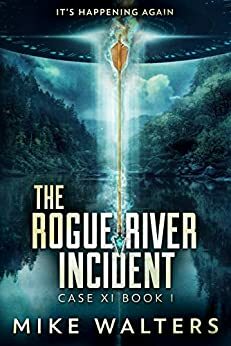 The event, known as The Rogue River Incident - Case X, remains unexplained. Decades later, in the small town of Rogue River, Oregon which borders the wild and scenic river of the same name, outdoor photographer, Mitch Wilde is thrust into a violent and unexpected situation when his best friend is shot with an arrow that dissolves inside his body leaving him seemingly unharmed. As more strange situations occur, an eccentric neighbor confronts Mitch and presents evidence of potential threats to their sleepy little town. When Mitch captures on film unexplainable footage of something slithering out of a nearby lake and returns home to show the footage to the eccentric neighbor, the duo is drawn into a web of unexplainable events as their small town comes under siege from unknown forces. Mitch scrambles to understand the circumstances and protect the ones he holds most dear. What follows in this book is classified as The Rogue River Incident, Case XI. It’s Happening Again. I too believe that we are not the only ones in the universe--so this was an easy book for me to get interested in. As strange things started happening, aside from reading to enjoy the book, I began to ask myself how I would react if those kind of things began to happen in our neighbourhood. I have to believe that even though I would be thoroughly fascinated, my fear of the unknown would override my curiosity. This was a great read and I enjoyed it right up until the last page. The truth is, I was stunned at how it ended. I enjoy cliff hangers, but this book ended so abruptly that, as a reader, I felt cheated. That is why I am giving it 4 stars! California author Mike Walters is originally from Oregon - the cornerstone for his debut novel that admixes his fascination of watching Ancient Aliens on the History channel, is love of Native American culture and a passion for the Pacific Northwest. He is a Director of Marketing & Product at Auto-Graphics, Inc. based in Ontario, CA, a company that makes software for Libraries. He adds "I am very fortunate to work in an industry that has a meaningful impact on society. It makes going to work each and every day enjoyable. I mean who doesn't think we need, and who doesn't love, libraries?" After high school he used his passion for photography as a photographer in the United States Air Force. Now he turns his attention to writing books - a fine adjunct to his work with libraries! And if those question and preamble don't encourage you to read this story, then perhaps a love of aliens and science fiction and the mysticism of the Native Americans that brew throughout this book will be the hook. He brings on his main character Mitch Wilde in a way that we know him fairly well form page one: `This location on the river-trail was one of his favorite spots with its serene views. The trail held a slight downward grade, a little wider than the rest of the path and packed firm, allowing for a smooth ride. Mitch placed an index finger on each brake lever in anticipation. He couldn't afford a serious wreck, knowing his body wouldn't heal as he approached fifty. Irritated with the way his helmet was sitting, he slowed slightly and reached up with his right hand, which was a mistake. He should have just stopped. His brain registered something from the corner of his right eye. What's that? Something flashed in front of him, stung his shoulder and tore the fabric. It distracted Mitch for a nanosecond. His front tire caught a tree root a touch wrong and then stuck in a small rut in the compacted clay soil. He broke one of his biking rules --pulling on the left brake lever only, which controlled the front brakes. The front heel locked for a fraction of a second. That was all it took...Why had he wrecked? Something hit him, but what? Leaning to investigate his condition, he heard something across the river. It sounded like a horse, which was odd. He'd never seen a horse on this trail.' It is this kind of terse writing that reassures us that we are in for not only a fine story but also an introduction to a writer who is practicing his trade well. Strange things are happening in Outlaw River, a small town in beautiful southern Oregon. Mitch Wilde, professional photographer, seems to be in the right place, on several occasions, to observe what-appear-to-be-impossible events. First, he is shot by an arrow while riding his bike in the hills, but the wound quickly heals itself and disappears. Later, his friend Jack is also shot by an arrow and miraculously heals but seems somehow changed. And these aren't the only weird happenings. At the same time, irascible neighbor Jasper approaches Mitch to share some of his research into what is going on in their region, and in the world. Of course, Mitch must investigate while protecting his family and friends. This page-turner keeps the reader engaged until the last page. 5.0 out of 5 starsAn afternoon of laughter! The Outlaw River Wilde is a comical sci-fi alien book. Mitch is an usual character who grows curious when strange events start happening. His friend is shot with a disappearing arrow and Native Americans on horses make appearances. He manages to get stuff on camera and video as the story progresses and finds there’s more to it then he originally thought. The author has a good voice for humor and makes this story a light hearted adventure. I will give away a sorta spoiler here and say it ends on a cliffhanger. The good news is book two is available. I was relieved when I saw that. I’m curious to find out what happens and learn more about the curious alien happenings. Fun story for an afternoon of laughs. Love the premise about the intersection of present and past worlds combining in supernatural ways. The characters are engaging and the idea of two distinct worlds intersecting is compelling. There were a few typos but overall the story kept me engaged. The main character's a bicycle jock with attitude and his encounter with horses, the Klamath Indians, and an arrow had me intrigued from early on. Good dialogue and plenty of action throughout.